When is a holiday basket not a basket? When you eliminate the basket all together and design an affordable gift that packs a punch without straining your budget. Most of us love to give gifts, but sometimes the economy of the situation does not allow us to go overboard. You might want a little something for a co-worker but only have $15-20 to spend. Sending gifts to thank your clients for their business is a smart marketing move, but being the clever business person you are, you have to watch your cost per gift. How do you acknowledge them with a gift that will get noticed, that looks personal, without breaking the bank? Simple! The easiest solution is to call us at Fancifull, we love taking problems off your plate. This year I have been having fun coming up with simple yet delicious gourmet gifts for under 35 dollars. I have been particularly smitten with mugs and mug/plate sets. The idea of someone with their mug of hot cocoa, or more potent beverage, relaxing and enjoying the spirit of the holiday makes me smile. I can’t help it, I always think of the person who is receiving the gift as I design. 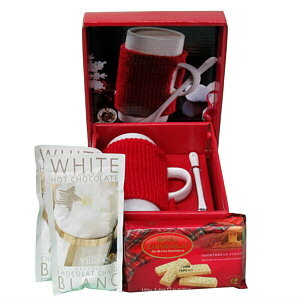 We have The Mug Hug, which is a mug wrapped in a red knit sweater in a box with white chocolate cocoa and buttery shortbread cookies. 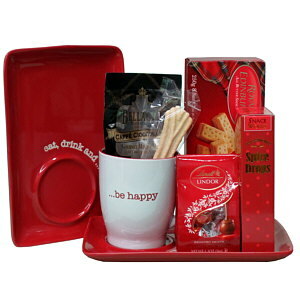 Then there is the Eat, Drink and Be Happy mug and plate set complete with hot drinks, cookies and chocolates that could be used year round. Want something more gourmet food oriented? How about our California Cheese gift box with 2 artisan cheeses, crackers, and almonds all wrapped in a California Fruit Label Box. One of our most popular gifts is the Fancifull Wine Caddy with a bottle of wine, cheese, crackers and nuts packed in a jute carrying bag for only $29.95. A great box of chocolates or our Velvet Rope Cake Truffles always make an impression. If you are a do-it-yourself kind of person, take these tips and come up with some gifts of your own design. Home baked cookies in a mug with a packet of tea is a lovely idea. A small tray with a candle, bath salts and some lotion is a more personal “time out” gift. For someone who is eating gluten free or has diet restrictions, find a cute plate and fill it with foods they can eat, wrap it and put a bow on it, voila – a thoughtful gift. A movie ticket wrapped with some popcorn is a treat I’m sure any friend would like. Once you start looking around you’ll find more and more possibilities. If the holiday pace picks up and you find yourself short of time and energy, well…you know who to call. Thanks for one’s marvelous posting! I truly enjoyed reading it, you can be a great author.I will ensure that I bookmark your blog and definitely will come back at some point. I want to encourage you to ultimately continue your great job, have a nice holiday weekend!